According to an article written by Robert Dalheim of Woodworking Network on August 17, Japanese car manufacturers are considering substituting wood for steel in order to make vehicles lighter. 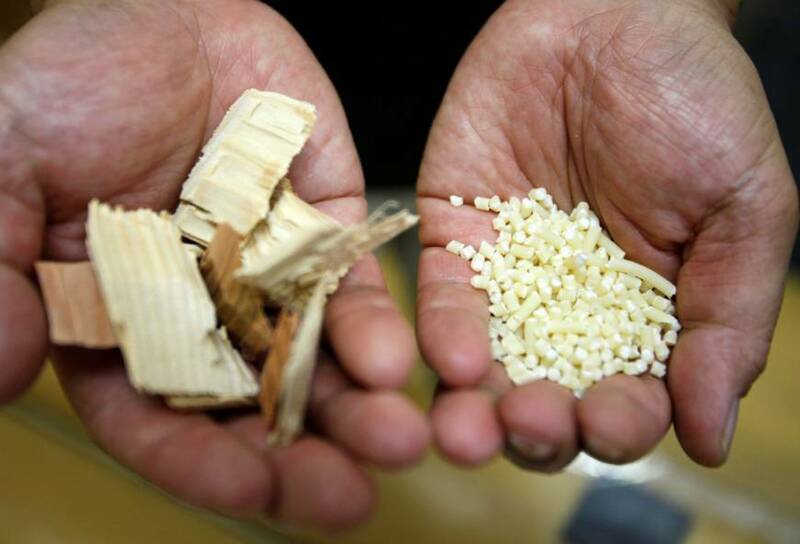 With wood pulp being 20 percent lighter than the weight of steel and five times as strong, wooden car parts are at the top of Japanese researchers’ considerations for reducing the weight of a vehicle. As manufacturers move toward churning out electric cars for a mainstream consumer base, reducing the weight of a vehicle will be crucial. Automobile suppliers are hopeful because a reduction in car weight would require fewer batteries, saving costs. Cellulose nanofibers are currently being used to create various products, such as ink and transparent displays. These fibers are obtained by breaking down wood. In cars, the chemically treated wood fibers will be kneaded into plastics while simultaneously being broken down into nanofibres, slashing the cost of production to roughly one-fifth that of other processes. This process is referred to as “the Kyoto Process,” named after Japan’s Kyoto University who’s leading the research. “This is the lowest-cost, highest-performance application for cellulose nanofibers, and that’s why we’re focusing on its use in auto and aircraft parts,” said Hiroaki Yano, professor at Kyoto University who leads the research. Yano’s team is working with several automakers in Japan to complete a prototype car built with cellulose nanofiber parts. They hope to complete it by 2020. “We’ve been using plastics as a replacement for steel, and we’re hoping that cellulose nanofibers will widen the possibilities toward that goal,” stated Yukihiko Ishino, a spokesman at DaikyoNishikawa, which supplies parts for Toyota and Mazda. Stay tuned for more wood innovations like wooden car parts by liking Grothouse on Facebook and following @grothouseinc on Instagram! 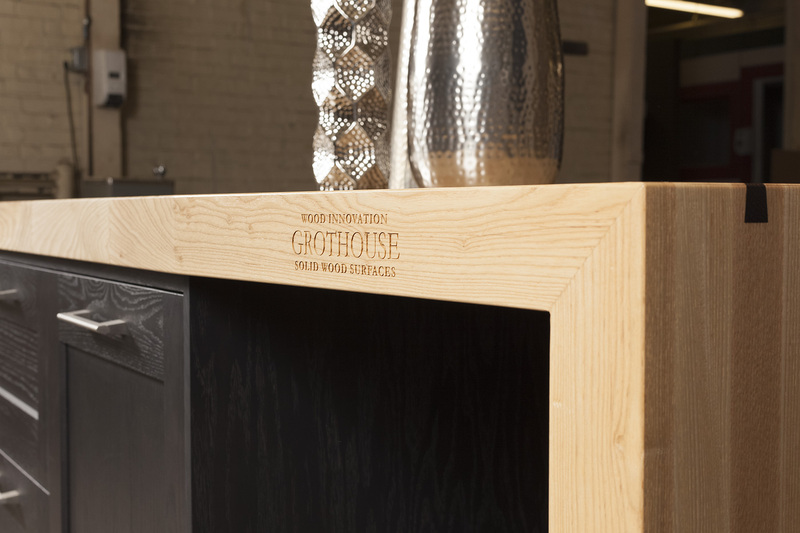 Grothouse custom countertops were on display at the 2015 Signature Custom Cabinetry Conference. 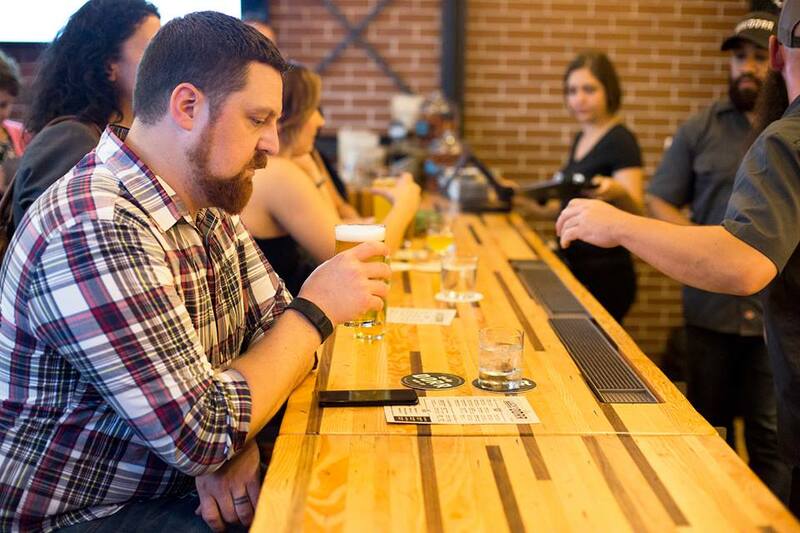 Grothouse is honored to have been included and in such great company! 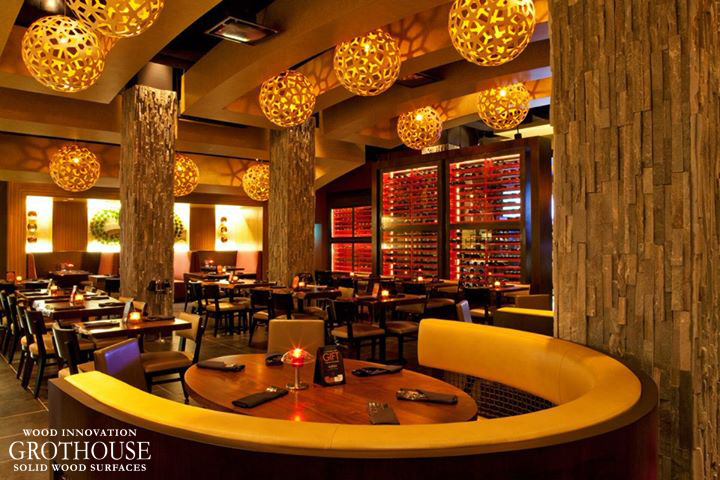 Lisa Martin of Signature Custom Cabinetry designed the following displays with Grothouse custom countertops. 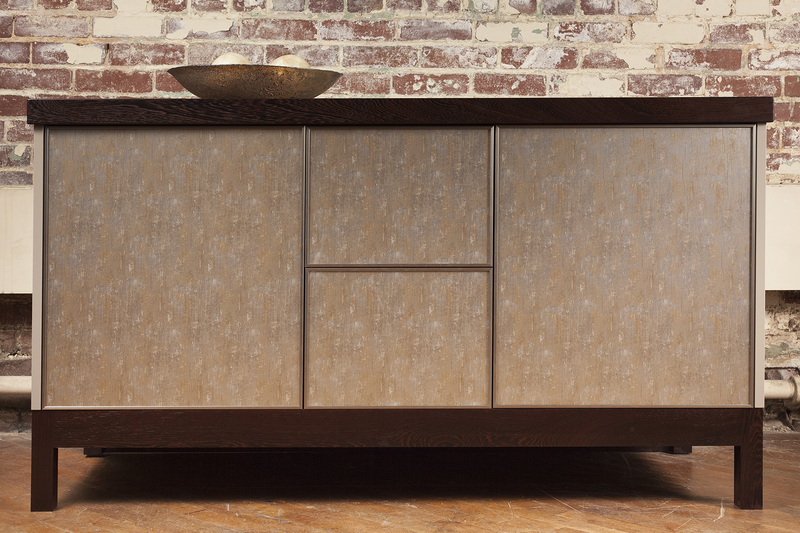 This vanity display includes an edge grain Wenge wood countertop. The countertop has a 1/8″ Roundover edge profile on the top edges, bottom edges, and vertical front corners. It is sealed with Durata® Waterproof Permanent Finish in satin sheen. 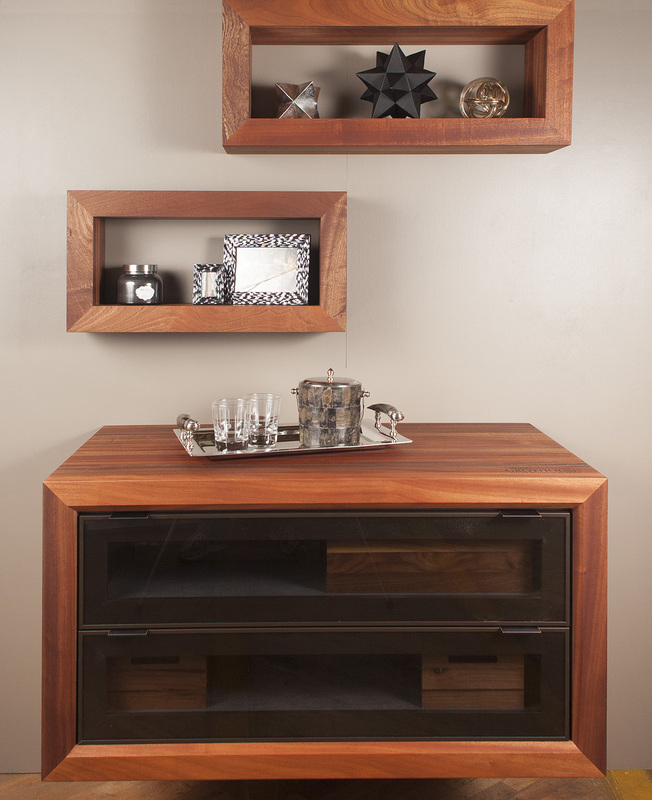 The bottom of the vanity display matches the top with a frame base made of Wenge. The frame base is also finished with Durata® in satin sheen. 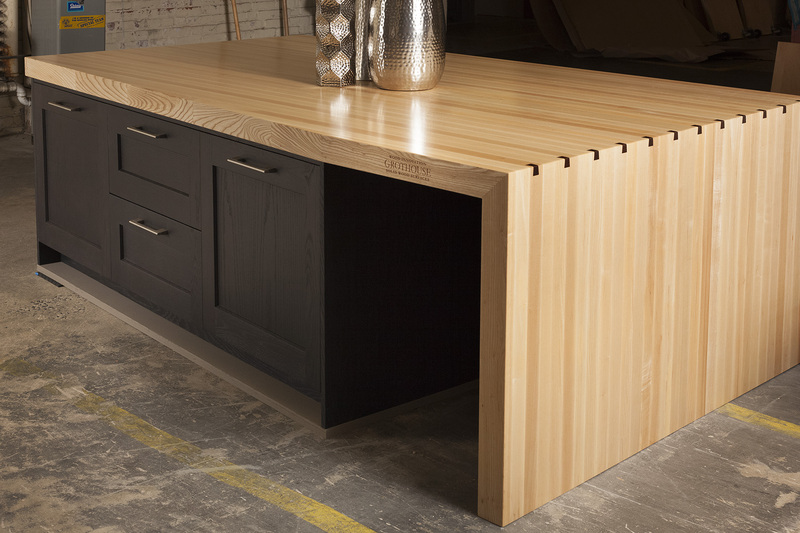 The kitchen island display featured an edge grain Ash Pastore™ Table with one leg and dovetail Wenge keys. 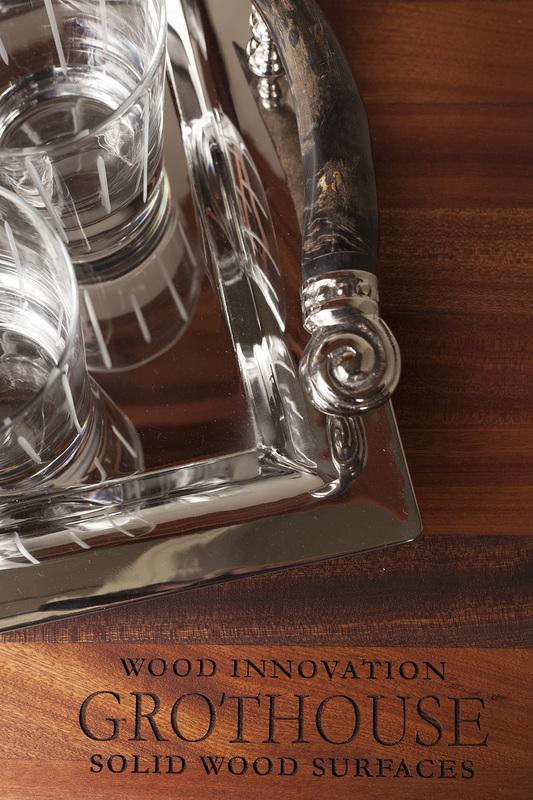 The table has a 1/8″ Roundover edge profile on the top edges, bottom edges, and vertical corners. It is sealed with Durata® Finish in satin sheen and includes laser engraving on the front edge. The cafe coffee station display included matching shadow boxes and a cabinet surround box. 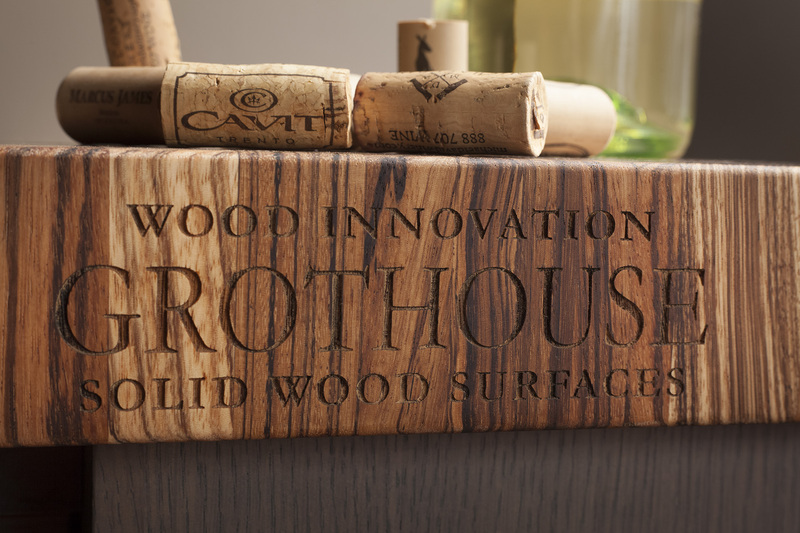 All of the boxes were crafted in edge grain construction of Sapele Mahogany wood and finished with Grothouse Original Oil™. 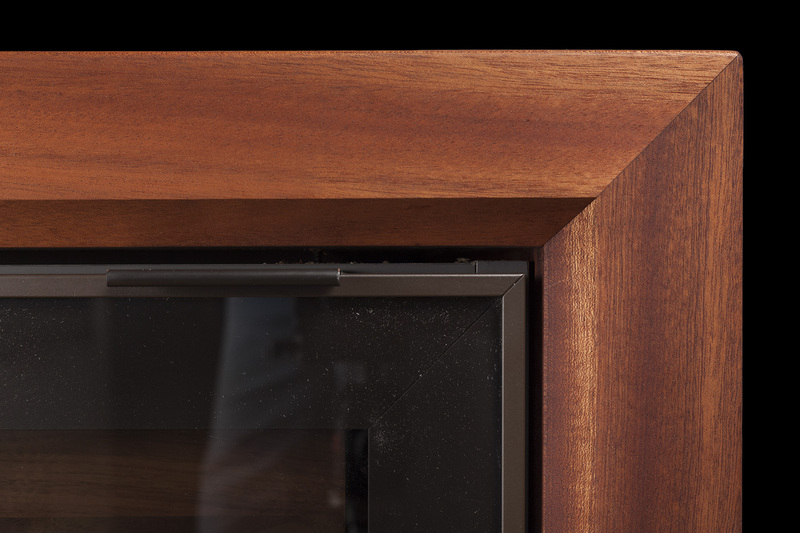 The cabinet surround box was crafted to perfectly fit around the cabinet and includes intricate detail. 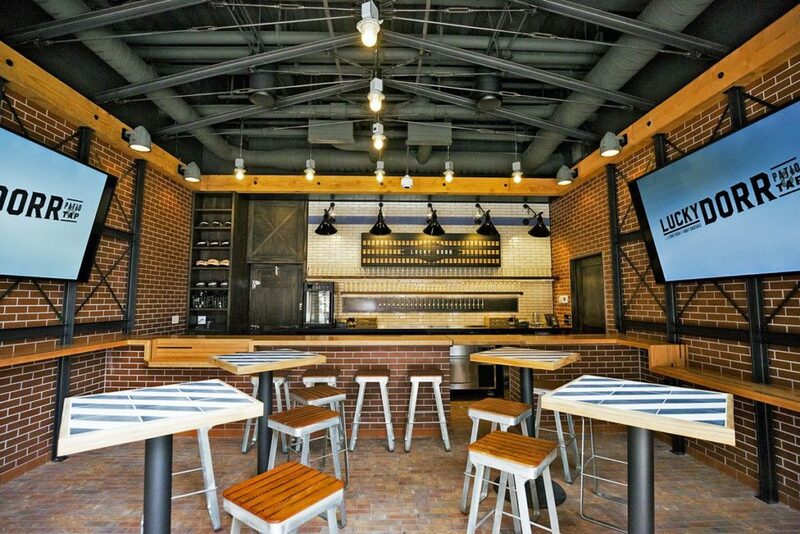 The center display featured an end grain Zebrawood butcher block with a 1/8″ Roundover edge profile. It includes laser engraving on the front edge. 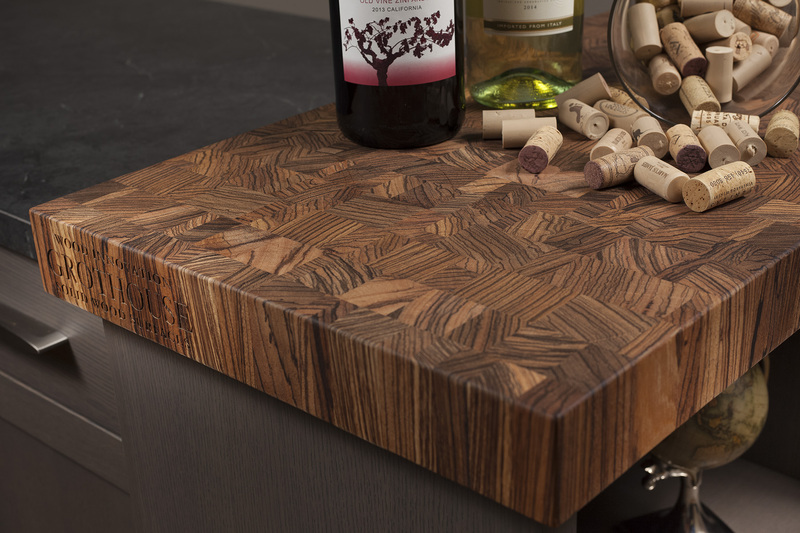 The butcher block is sealed with Grothouse Original Oil™ food safe finish. 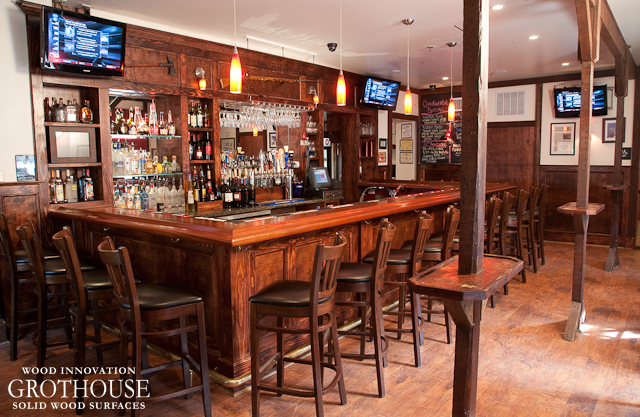 Follow us on Houzz to view more custom countertops on display. 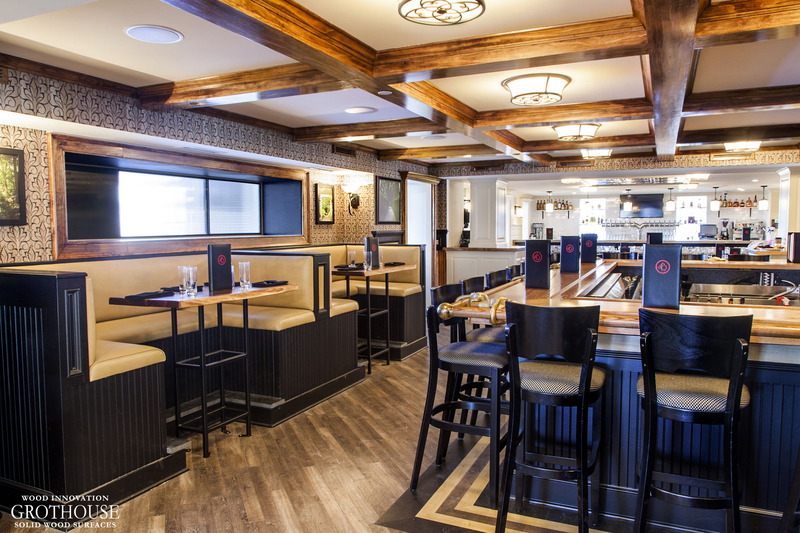 Our on staff engineers were ecstatic when the world class Disney® Imagineers contacted Grothouse to craft White Oak wood counters for the Trolley Car Café at Disney’s Hollywood Studios®. 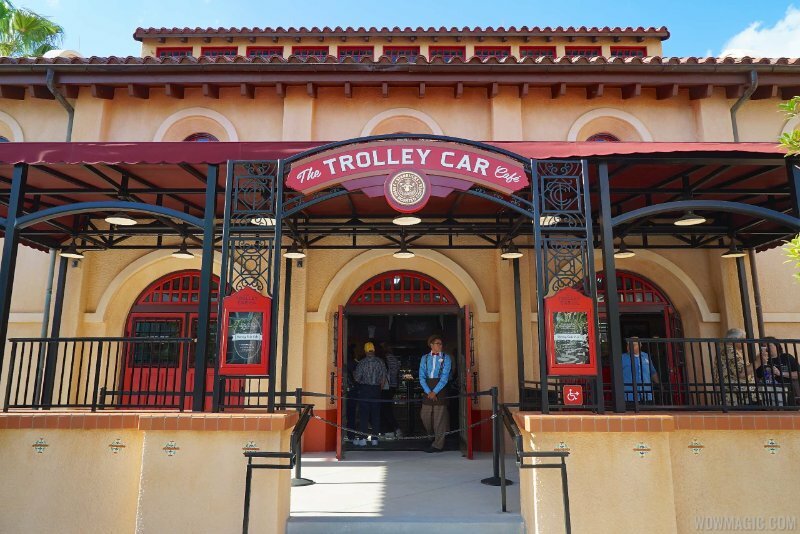 Step inside this classic trolley car station and explore a unique experience for all kinds of coffee lovers — including a selection of Starbucks® coffee and specialty beverages, Disney baked goods and La Boulange™ pastry items. This inventive group has their finger on the pulse of the design community, as we are seeing the industry’s top trend setting designers specifying White Oak countertops for residential kitchen designs as well. 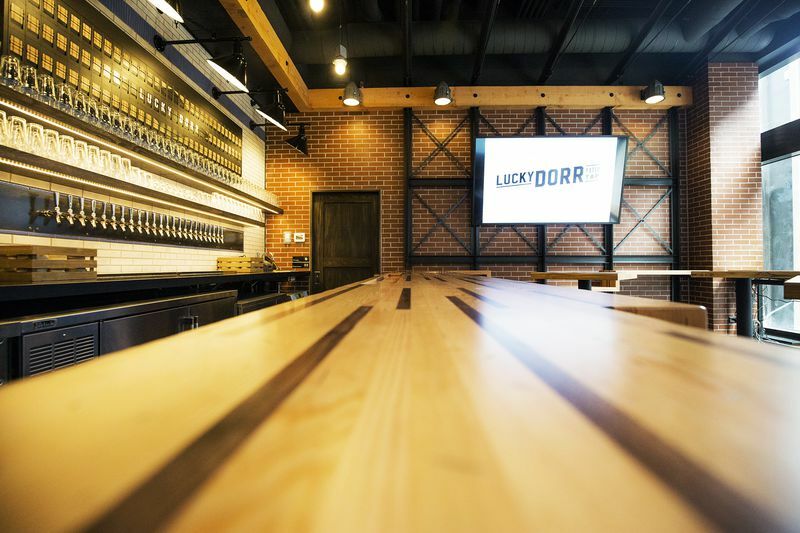 The White Oak wood counters were crafted in flat grain construction. 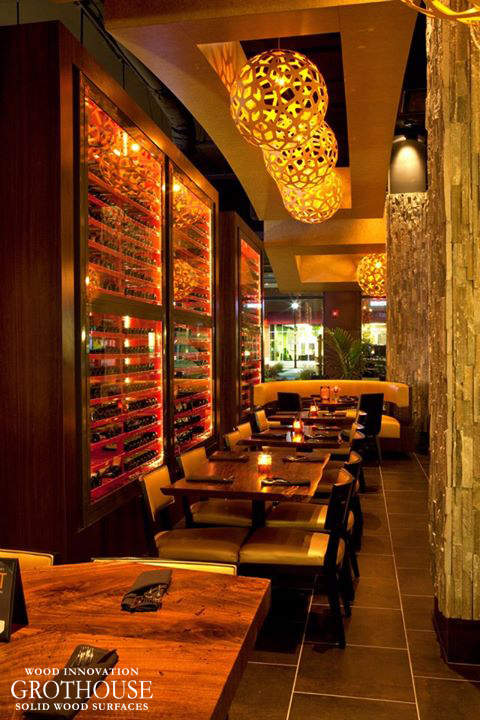 In a flat grain counter, the wood pieces are premium-clear wide plank flat sawn boards. The pieces are generally wider in size, enhancing the long modulary rays that white oak is highly renowned for. 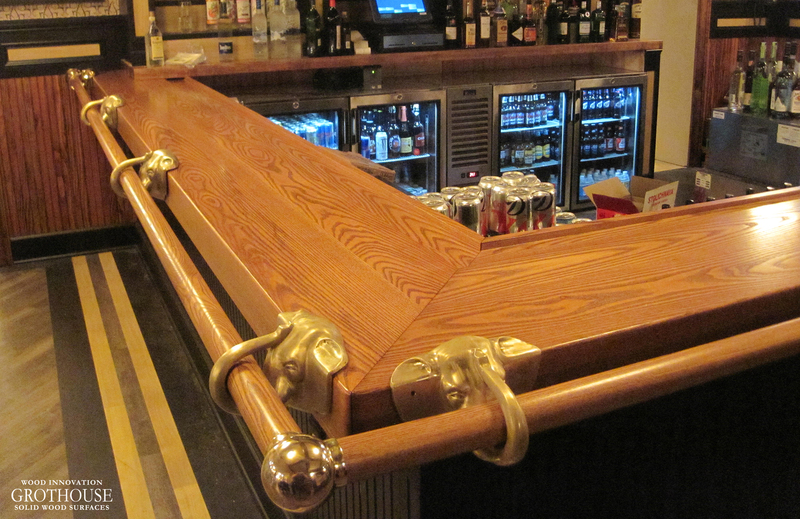 Grothouse crafted two counters for the café that are 1 ½” thick by 33 1/8” by 153”. The counters include a classic 1/8” Roundover on the top horizontal edges, bottom horizontal edges, and vertical corners. Sealed with Durata® Waterproof Permanent Finish in Satin Sheen, the counters will stand up to the demanding commercial use. Durata® Finish creates a waterproof surface. Water left on the surface simply dries with no water rings. It is also highly chemically resistant, even lacquer thinner does not affect the cured surface. 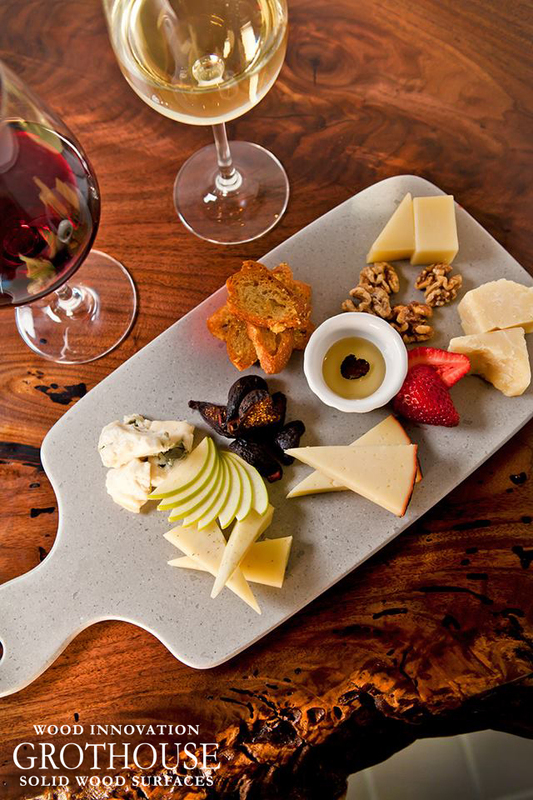 Red wine, vinegar, alcohol, soaps and coffee will not affect the finish. 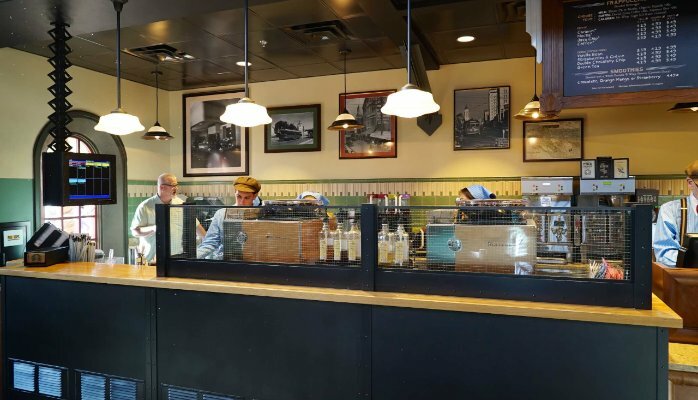 See the counters in person at The Trolley Car Café located in Disney Hollywood Studios®. 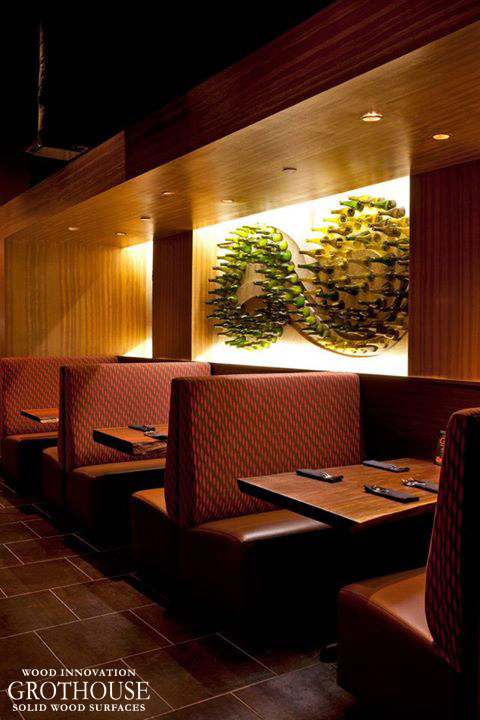 Gain inspiration from other designs of commercial wood counters in our Countertop Image Library. 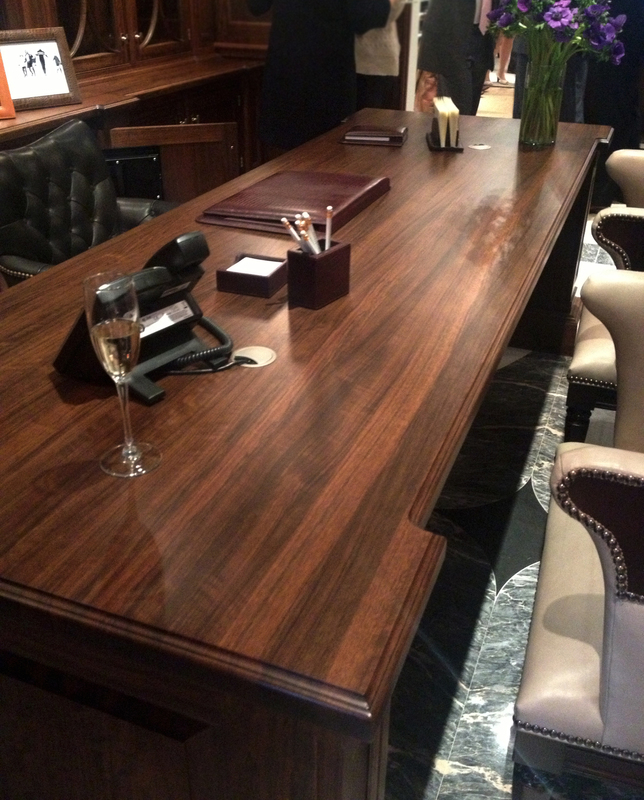 Wood desk tops can be custom crafted for commercial office spaces or residential office spaces. If you have ever worked in an office, whether at work or at home, you know how influential your surroundings can be. The desk surface, in particular, plays a critical role. It should be functional, comfortable, and customized to fit your specific space. Wood has been used as desk tops for years. Wood is a warm, comfortable, and natural material, yet it is strong and sturdy. 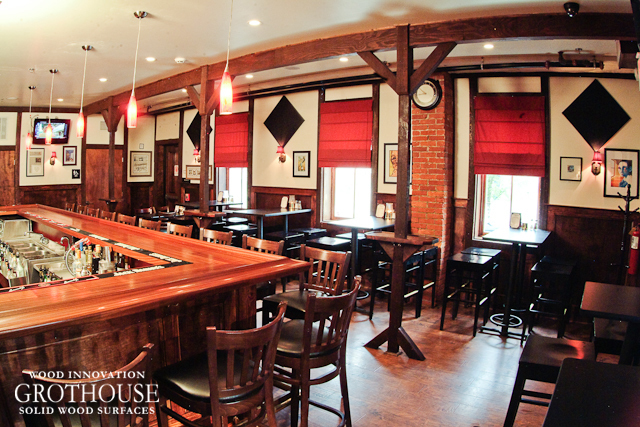 Grothouse wood tops can be finished with Durata® Waterproof Permanent Finish. Durata® Finish is significantly harder than Tung Oil Urethanes, and creates a scratch resistant and waterproof surface. Water left on the surface dries with no water rings. It is also highly chemically resistant. 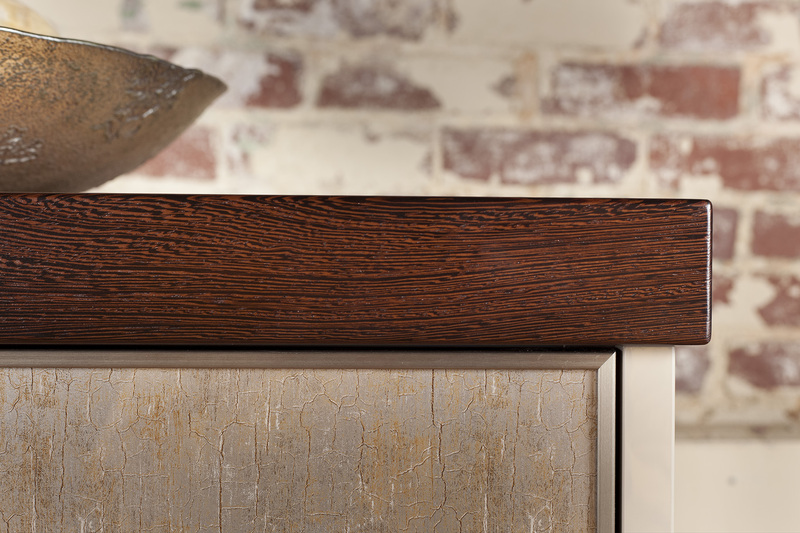 Click here to learn more about Durata® Finish. 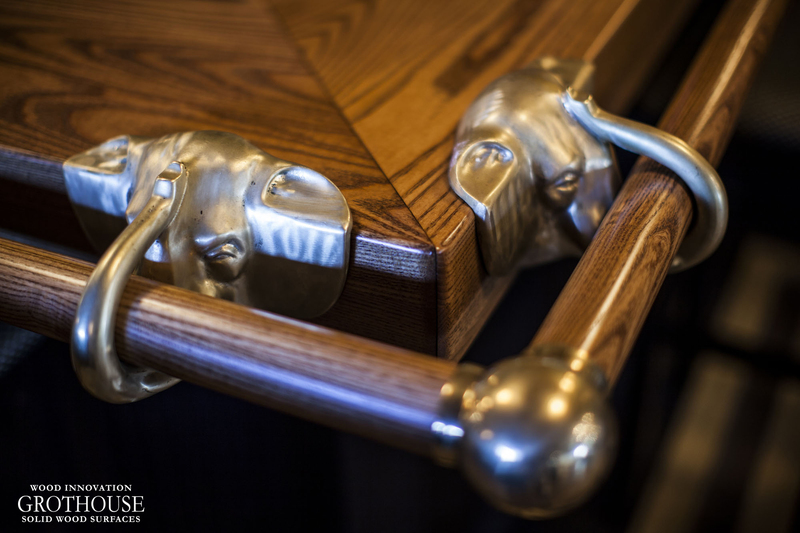 Wood desk tops can be custom crafted to any specifications and can include a variety of functional features and options. 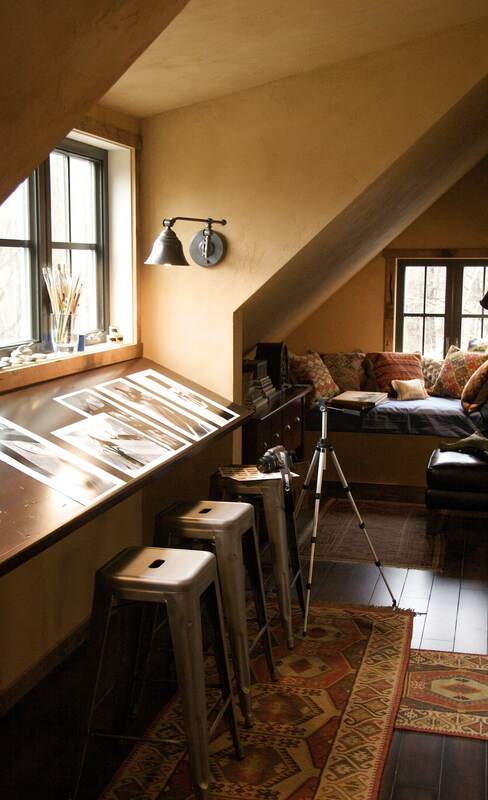 View the office spaces below for some design inspiration. Lobkovich designed this Walnut desk top for a residential office space. The top is 2 inches thick by 25 inches by 134-1/2 inches. It includes a Standard Ogee edge profile on one long side and two short sides, with square bottom edges. The desk top is sealed with Durata® Waterproof Permanent Finish in Matte Sheen. 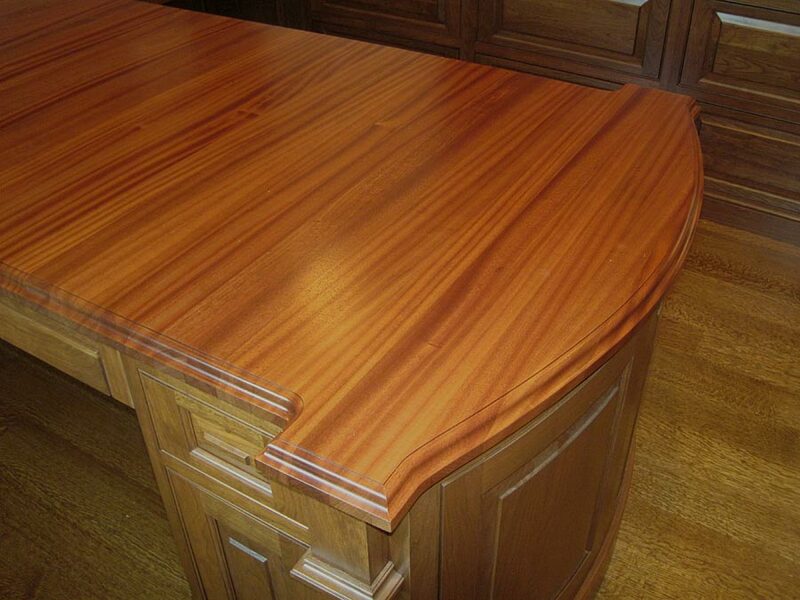 Sapele Mahogany Desk Top designed by Stimmel Consulting Group, Inc. 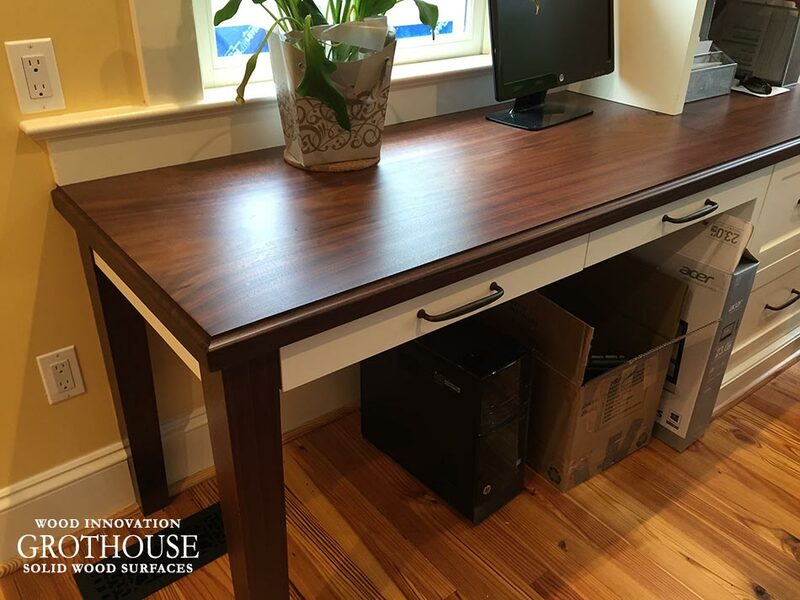 This Sapele Mahogany desk top was designed by Stimmel Consulting Group, Inc. for an office space with traditional style cabinetry. The desk top includes a roman arc with notched corners and a Standard Roman Ogee edge profile. It is sealed with Durata® Waterproof Permanent Finish in Satin Sheen. This is not your ordinary office desk top, but rather a photographer’s desk top. This top was custom crafted to fit in the small space and allow for enough room for big photographs to be viewed. For more wood desk top design inspiration, visit our website and follow our Instagram page!